Dedicated to telling the real story about issues facing Tennesseans and developing public policy that provides families the opportunity to be safe, healthy and successful. Rep. Timothy Hill is trying to re-write the state Medicaid program known as TennCare. A Republican proposal under consideration could cause Tennessee’s Medicaid program known as TennCare to lose $1 billion in federal funding by 2027, according to an analysis of block grant legislation. The analysis that predicted the $1 billion reduction was prepared by Avalere, a healthcare consulting group that calculated the costs associated with federal legislation aiming to convert the Medicaid program into a block grant system. President Donald Trump promised block grant funding for Medicaid as a candidate. When Republican members of the U.S. Senate attempted to write legislation to make Trump’s promise a reality, the proposal failed because it could not even gain traction within their own party. Under current federal Medicaid rules, anyone who qualifies for TennCare insurance (primarily low-income residents and the disabled) is covered for services defined by both federal and state officials. The block grant plan would give the Tennessee legislature more control over who gets health coverage and for what services. A block grant would dole out money to Tennessee based on a formula, but so far the formulas have led to lower federal outlays over time. In recent years, the federal government has paid for about 60 percent or more of the cost with state tax coffers responsible for the rest. Any reduction in federal spending for the program could cause serious problems in Tennessee, where TennCare funding in the second largest expense (22% in FY2016-2017). Both the American Hospital Association and the Federation of American Hospitals have warned about the consequences and legality of block grant funding, according to ModernHealthcare.com. The proposal HB1280, sponsored by Rep. Timothy Hill, R-Blountville, District 3, directs the governor to seek approval for a block grant from the federal Centers for Medicare & Medicaid Services. 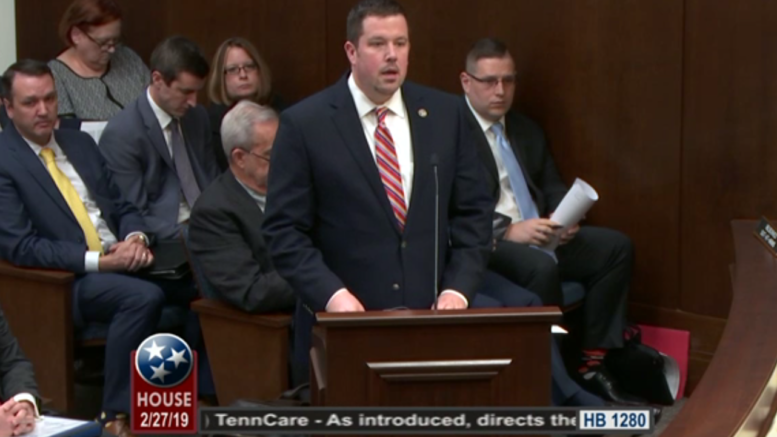 The measure passed the House TennCare Subcommittee on Feb. 27 by a 5-2 vote and will be voted on by the House Insurance Committee on March 6. A reporter for The Tennessean who attended the Feb. 27 subcommittee meeting captured exactly how few details are known before Republican members decided regardlessly to send the bill the full House Insurance Committee. Sycamore Institute: What is TennCare?